This is the story behind my Guinness World Record™ for the Most gloves put on one hand in one minute. This time it’s Italy – Milan in northern Italy, to be exact. I’ve been brought in to participate in an Italian world records TV show. Of course I’m focused on what I am here to do: put as many gloves on one hand as I can in a minute as my first world record attempt, before numerous others. I hold this world record, and I’m here to try beating myself. But there is so much else happening, and there are so many incredible people alongside me, participating in the same TV show, that’s I’ve simply got to brief you on who’s around. In many senses, their presence makes my gloves activity seem irrelevant. I stepped off the flight in Milan, after 28 hours of flying from New Zealand via Hong Kong and London. Into the hotel I walked to find an appealing mix of interesting characters. If ever the world were a circus, I thought I was then in the centre of it! Acts had been lined up, including the world’s furthest, most, tallest, smallest, highest and most painful. They’d be hosted by the renowned Italian TV presenter, Gerry Scotti. David Smith – the world’s greatest human cannonball – and his crew had just finished seeing to the unloading of their 12-metre long cannon on a nearby soccer field. There, a day later, the TV production staff had filmed the human cannonball fly what seemed like a mile into a large net, breaking the current world record. Quite unbothered by it all, David minced his way around the hotel as humbly as any other. If it weren’t for his unique performance shirt, you may never have known what an astonishing person he truly is. An Italian man gestured a greeting to me, which immediately signified that we faced a complete communication barrier. I nodded in return and politely moved along. But how unobservant of me! A day later, someone pointed out to me that Antonino Maimone from southern Italy has 24 digits: 6 fingers on each hand and 6 toes on each foot. Through a translator, his wife explained that when she was pregnant with their daughter, she’d been worried how many digits her little girl would have. But, thank goodness, there was no shock to her parents. An Indian-looking couple entered the dining room and I saw nothing unusual at first. The mother carried a baby and I looked more closely to figure out what their world record performance might be. Nothing special, as far as I could see. But then something struck me. The baby could hold a dessert spoon – and I watched her eat, only able to fit a single corn flake into her mouth at once, and she had many rings adorning her fingers. That’s no ordinary baby, I realised. It was Jyoti Kisanji Amge, the world’s smallest teenager. She is from India and stands barely as tall as my knee. She’s 17. I got Jyoti and her mother on camera just as we were leaving the studio after a very long day’s filming in which Amazon Eve – the world’s tallest supermodel – had been sat alongside tiny Jyoti for an interview. Then a group of Americans came along, and the man among them seemed to be an incessant talker. I blocked out the noise but overheard a word: diving. My ears perked up and soon, Darren Taylor and I were chatting. He is a man I have been amazed about for years. Darren, known as Professor Splash, is the world record holder for the highest shallow dive. Oh my gosh. He climbs scaffolding and jumps – looking skywards – into only 30 centimetres of water. How this man hasn’t pulverised his spine I don’t know. But as sure as the world is round, Darren Taylor was sitting in front of me, chatting away. I heard about how he’d smashed an ankle in a high dive, and hit his chin upon landing once. And then he announced his participation in the show was to dive 11 metres and 8 centimetres. He was a nervous wreck. No wonder – each time he did his stunt, he risked vast damage to his body. In one of Ed China’s special road legal travelling items of furniture, Darren was driven out to the tower where he launched into the night air. A few seconds later, there was an almighty splash – and Darren the high diver stood on his own two feet. He was not paralysed, dead or in more than one piece. The entire audience relaxed and one could feel the mood change the instant he rose to punch the air with great gusto. Two Indian men walked into the hotel foyer. The younger of the two looked like others of Indian origin. But Tim Shieff – the world’s greatest free runner – leaned over to whisper in my ear, “I bet his stunt is something truly awesome”. Tim was right. Rakesh Kumar later showed us a hooked length of metal. So what? A moment later, because Rakesh speaks no English, he slipped the metal inside his left eye socket since he had no other way of explaining what the metal was for. Those watching arced over backwards, turned away, and some squealed. I threw my hands over my own eyes and felt my stomach turn. With much hand gesturing, we got to understand that Rakesh was here to lift the greatest weight with his eye socket. Several of us wanted to vomit but controlled the spasms. Then Raskesh pulled his ear. Oh no, what now… We all learned that his intention was also to lift the greatest weight with one ear, a feat he succeeded at on the 3rd attempt: 81 kilograms. Depressingly, I needed to concentrate on my simple task: to practice pulling as many gloves over my hand as I could in a minute. I could do it, for sure. And when the moment came, the stage doors opened and I was immediately the focus of a dozen manned high-tech TV cameras. In I walked against a backdrop of massive multimedia screen displays of the world record show’s logos and video imagery across which flicked my name in letters almost as tall as me, the guest audience cheered and waved energetically, and innumerable spotlights criss-crossed the glitter-impregnated floor in every direction. The immaculately dressed Italian presenter announced my lone appearance with a raucous royal-like welcome amid a flurry of loud introductory music and so much glamorous performance hype that it numbed my senses. You could have been forgiven for thinking the latest superhero had flown in at the speed of light from a distant galaxy to save the world. Calm down Mr Presenter, I thought – I’m only here to wear a few gloves! Actually, that grand entrance was to be mine less than 120 seconds away, I could see, judging from all the appearances to have gone before me. Right then, the producers decided to cut the filming for the night. My mind instantly became a vacant space. What? Was this really happening to me? Several moments later, the realisation hit me that I’d need to postpone my glove-wearing energy for some time. It would be 5 days to wait. During this time, more celebrities arrived at the studio. Among them was a British man with a great deal of hyperactive flair. Stevie Starr was his name, I heard as he danced about, introducing himself to anyone he saw. Very social! Very special too, I soon learned. Stevie was renowned for swallowing coins, pool balls and other items – and then regurgitating selected marked items upon demand. What’s more, if it goes down his oesophagus dry, it comes up dry too, I was told. You work that one out! What a load of rubbish, I thought… until he practised in the studio and the spectators gasped in awe. But what Stevie is less known for is his luggage bag. With pride, he ran his finger over the 700 baggage claim tickets wrapped around his bag straps, accumulated over 10 years of doing shows worldwide. It seemed the baggage identity strips weighed more than the bag. I just had to get a photo. As if I hadn’t yet been shocked off my feet, Garry Turner ambled into the studio hours before I made my record attempt at the most gloves on one hand in a minute. Garry who? Oh, he’s also known as Garry Stretch since he travels the world performing for media. I watched him pull his neck skin over his face up to his nostrils, as his way of introducing himself to the room he walked into. With seemingly no fuss, he sat down and began calmly answering inevitable questions while pulling his skin high off his body this way and that – extraordinary! The funny thing is that within an hour, we were used to Garry’s amazing ability and people began discussing everything but his skin. Next, I was back! This time, things were working out. A table was waiting for my attention to the side of the main studio in a mini studio. Nervously, I laid the gloves out in perfect position, expecting to put 12 on my hand at once. With cameras rolling, the world record representative launched into announcements, and the next thing, it was all action. 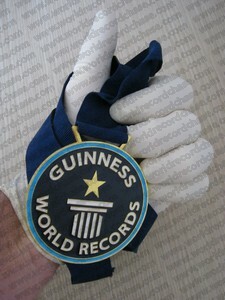 To my amazement, I was awarded a new world record for placing 13 gloves on my left hand in a single minute. Talcum powder had been spilled across the table, and I’d ripped one glove at the base. But what did that matter? I threw my arms skyward, yelled glory and saw the representative’s assistant reaching for something. Turning, I saw a large circular medal being raised around my neck and one of those prized world record certificates was thrust into my hands next. Oh dear, I thought. How delightful – another world record. But a twinge of irritation struck me. That was one achievement: I wanted 50 at once. And, being the outspoken man I am, I locked my focus on the senior production staff before telling them exactly that. The looks I got were very much ones of surprise, but I’d got my point across.